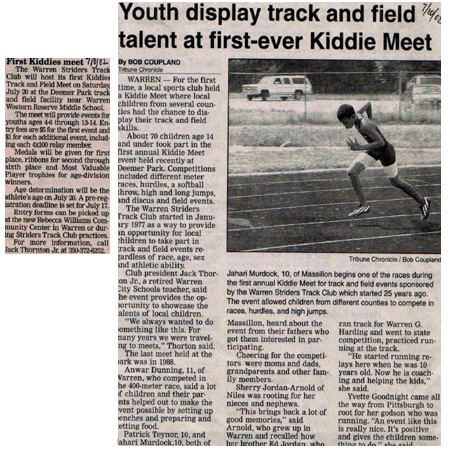 The First Kiddies Meet, July 20, 2002, was held at the Deemer Park Track and Field Facility. 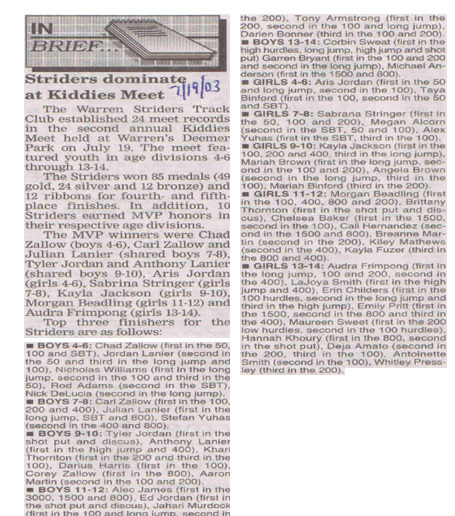 The meet, providing events for youths 4-6 through 13-14 will become and annual fundraiser for the Striders. Medals were given for first place, ribbons for second through sixth place. MVP trophies were presented to age-division winners. Some 70 children participated. Records will be kept for each division (4-6, 7-8, 9-10, 11-12, and 13-14). The Second Annual Kiddies Meet was held July 19, 2003 at Deemer Park. The club established 24 records, collected 85 medals (49 gold, 24 silver, 12 bronze) and 12 ribbons for fourth and fifth place finished. Ten Striders earned MVP honors in their respective age divisions.